Remember when I blogged about the Jane Austen Action Figure? I thought I'd seen it all with that one. 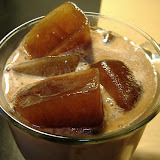 Well, here's another doll-ish oddity, this one for the coffee hounds. 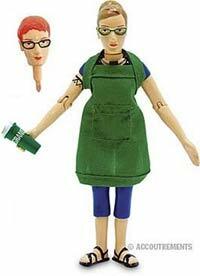 A really truly Barista Action Figure. Go figure. Heh. No other barista in town makes a latte like Nico. Her beans are always freshly ground, she never tamps the filter basket too tight and her foam is perfect: thick and decadent, like a pillow of edible clouds. Each 5 inch tall hard plastic Barista Action Figure has moveable arms and legs and comes with two interchangeable heads and two different sized cups (tall and grande) that she can hold in her hand. Now, I could make a comment about the two-headed barista that works in that awful coffee shop up the street... but I won't.